Hundertwasser's father Ernst Stowasser died three months after his son's first birthday. The Second World War was a hard time for Hundertwasser and his mother Elsa, as she was Jewish. They avoided persecution by posing as Catholics, a credible ruse because Hundertwasser's father had been a Catholic. To remain inconspicuous, Hundertwasser joined the Hitler Youth. Hundertwasser developed artistic skills very early. After the war, he spent three months at the Academy of Fine Arts in Vienna. At this time he began to sign his art as Hundertwasser instead of Stowasser. He left to travel, using a small set of paints he carried at all times to sketch anything that caught his eye. He had his first commercial painting success in 1952-3 with an exhibition in Vienna. His adopted surname is based on the translation of Sto (the Slavic word for "one hundred") into German. The name Friedensreich has a double meaning as "Peaceland" or "Peacerich" (in the sense of "peaceful"). The other names he chose for himself, Regentag and Dunkelbunt, translate to "Rainy day" and "Darkly multicoloured". His name Friedensreich Hundertwasser means, "Peace-Kingdom Hundred-Water". Hundertwasser married Herta Leitner in 1958 but they divorced two years later. He married again in 1962 but was divorced by 1966. He moved into architecture from the early 1950s. Hundertwasser also worked in the field of applied art, creating flags, stamps, coins, and posters. His most famous flag is the Koru Flag. As well as postage stamps for the Austrian Post Office, he also designed stamps for the Cape Verde islands and for the United Nations postal administration in Geneva on the occasion of the 35th anniversary of the Universal Declaration of Human Rights. 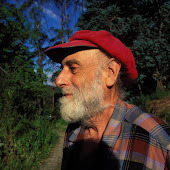 Hundertwasser considered New Zealand as his official home, and no matter where he went in the world, his watch was always set to New Zealand time. He was buried there after his death at sea on the RMS Queen Elizabeth 2 in 2000, at the age of 71. *มี 5 ชิ้นผลงาน Limied Edition by Hundertwasser คลิ๊กชมครับ!